Navigating Regulatory and Permitting Issues: Waters of the U.S.
Terracon is well known for providing Phase I and Phase II site assessment services to a wide range of clients on many property types. But did you know that aside from dry land, many bodies of water can be subject to federal regulations? Our natural and cultural resource services can help property owners navigate regulatory issues related to bodies of water and wetlands, and they can help optimize developable land while minimizing costs. Some typical property types which can require these services include vacant, undeveloped, open, or agricultural land roadway right-of-way, existing utility easements, and other properties where soil will be disturbed. WOUS services are among the most commonly requested services from our natural and cultural resources group. Given current regulation many depressional areas, small bodies of water, ponds, streams, and wetland areas can be subject to federal regulations and can present development constraints. Our natural/cultural resources experts work closely with clients when they must address policies and regulations which relate to construction activities affecting WOUS. The two primary laws that affect WOUS are the Clean Water Act (CWA) of 1977 – Section 404 and Rivers and Harbors Act (RHA) of 1899 – Section 10. CWA Section 404 establishes a program that regulates discharge of dredged and fill material into WOUS. Fees and/or punishment could be leveed if the law is violated. The Environmental Protection Agency (EPA) has ultimate authority for determining whether a property is jurisdictional. In other words, the property contains WOUS that are protected by one of these laws. The U.S. Army Corps of Engineers (USACE) can also provide such determinations and issue permits for activities that affect WOUS. With this in mind, there are several permitting scenarios, and each property presents its own set of considerations. That is why, when it is time to develop or improve a property, hiring a consultant can make a construction project easier and more efficient. 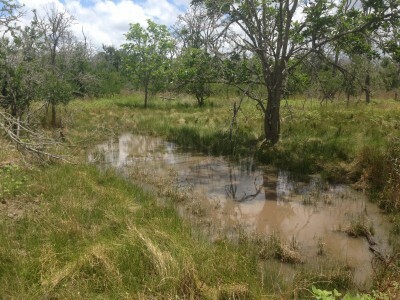 The U.S. government defines wetlands as areas inundated and/or saturated by surface or ground water at a frequency and duration sufficient to support, and that under normal circumstances do support, a prevalence of vegetation typically adapted for life in saturated soil conditions. WOUS include all traditionally navigable bodies of water (TNWs) and the wetlands adjacent to other WOUS. A major issue for clients who may have wetlands on their property is finding out whether the wetlands and waters that are adjacent to them would be considered jurisdictional by the USACE. The USACE determines whether each wetland and water can be classified as jurisdictional or isolated (non-jurisdictional). They make these determinations by performing an Approved Jurisdictional Determination (AJD) or a Preliminary Jurisdictional Determination (PJD). 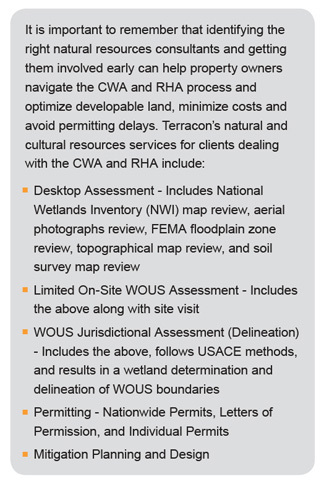 Clients employ Terracon to perform WOUS determinations, guide them through the permitting process, provide field assessment findings and evidence to the USACE, and act on their behalf during consultation with the USACE and EPA. An AJD is completed by the USACE either through a desk determination, which is an in-house evaluation of the documents provided by the applicant and resource documents, or through a site visit. To declare an isolated determination, it must be shown that there is no significant nexus, which is a physical, chemical, or biological connection to the traditional navigable water. This requires a significant nexus test and coordination with EPA. EPA coordination does not have a set time frame. However, the agency has 15 days to decide whether they agree with the USACE decision or if they would like to elevate the site to a “special case” situation. When a situation is classified as a “special case,” a decision can take anywhere from six to 18 months. Alternatively, a client may waive a lengthy AJD process to accelerate permitting and choose the PJD process. A PJD is a written acknowledgement that there may be WOUS, including wetlands on the site, and it assumes that these potential WOUS are jurisdictional. The PJD is completed by the USACE as a desk determination or a site visit and usually takes 30-45 days. An applicant must request a PJD, and it is at the discretion of the USACE project manager to determine whether this option is appropriate. PJDs are usually preferred for projects with multiple crossings such as linear transportation projects. The potential downside of a PJD is that the applicant could be responsible for costly mitigation, which may not be required if the wetlands and/or waters are determined to be isolated after an AJD. A good consultant can assist a client in making the proper decision about a PJD, an AJD, avoidance and minimization, or assist in obtaining one of the permits described below, if required. NWPs are pre-existing authorizations for common, small-scale, specific activities which result in minimal impacts to WOUS. Typical NWPs include NWP No. 12 for utility line activities, NWP No. 14 for linear transportation projects, and NWP No. 39 for commercial and institutional developments. These permits are typically for projects that result in .5 acres or less of permanent impacts to WOUS, including jurisdictional wetlands. The NWP process includes a five-day internal review by the USACE and resource agencies. Some NWPs require a Pre-Construction Notification (PCN) that requires the applicant to notify the USACE prior to commencing specific activities onsite. All PCNs must be processed internally by the USACE within 45 days of receipt of a “federally complete” permit application. NWPS are appropriate for small, “single and complete” projects. The USACE does not want to issue NWPs to projects that can be considered “piece-mealing” such as authorizing multiple NWPs for a larger overall project which would likely not be evaluated as a NWP. IPs are typically required for projects such as large-scale commercial development, stream re-routing and channelization, and new roadway construction projects, resulting in greater than .5 acres of permanent impacts to WOUS, including jurisdictional wetlands. IPs require property owners to notify the USACE prior to beginning activities onsite. With an IP, an Alternatives Analysis must be performed on the project and provided to the USACE. The Alternative Analysis is an analysis of reasonable alternatives to prove that the proposed action is the Least Environmentally Damaging Practicable Alternative (LEDPA). The IP involves at least one 30-day public notice period and notifying other agencies, non-government agencies, and adjacent property owners to the proposed project site. After the public notice, the applicant must respond to comments received during the public notice. These responses must be deemed adequate by USACE. The IP Permit process can take one to two years or more. Compensatory mitigation is typically required for impacts in excess of .1 acre. If the USACE determines that an unauthorized activity has occurred on a project site, the USACE can stop work on the project site, the property owner will be required to apply for an after-the-fact IP (regardless of the amount of impacts to jurisdictional areas), and could be subject to costly mitigation measures and potentially to additional fines. A consultant can assist clients in determining whether a permit is required, and can assist in site planning to avoid these potentially costly issues. If you have any questions about WOUS and permitting, do not hesitate to contact us. We can answer questions and help you contact your natural resources specialist. The information provided above may change in the near future. The EPA and USACE jointly released a proposed rule to clarify protection under the Clean Water Act for streams and wetlands that form the foundation of the nation’s water resources. The proposed rule is open for public comment in the Federal Register. Remember, your voice counts so please provide comments on the new proposed rules. You can comment and find more information at http://www2.epa.gov/uswaters. local natural resources specialist. Terracon is ready to assist clients who are affected by these changes.